Luigi Bolmida was the son of Baron Giuseppe Bolmida. He studied ecomonics at the University of Bologna. His father was a private banker and a silk merchant. 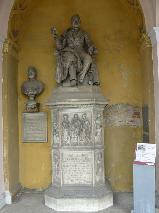 He left the company to his sons, who built the first spinning mill to in Italy that was used to produce silk. After a decline in the silk market in 1841 the company faced liquidity problems. The economic reforms by Cavour led to a collaboration between them and he often intermediated between the government and private bankers. He participated in the establishment of the Banca di Torino. In 1849 it merged with the bank of Genoa. In 1850 he supported Cavour when the latter introduced his banking law. He was a Member of the Subalpine Parliament. and he played an important part in attracting funding from abroad, against the wishes of the local bankers. At the same time he protected his own interests as a banker. He died in 1856 of a heart attack. 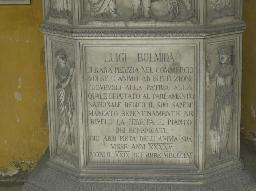 The grave of Luigi Bolmida at the Cimitero Monumentale, Turin.